Every historical encounter mentioned of European colonial rulers is of land forcefully or deceitfully taken over, cultures cleansed, identities destroyed and people massacred. 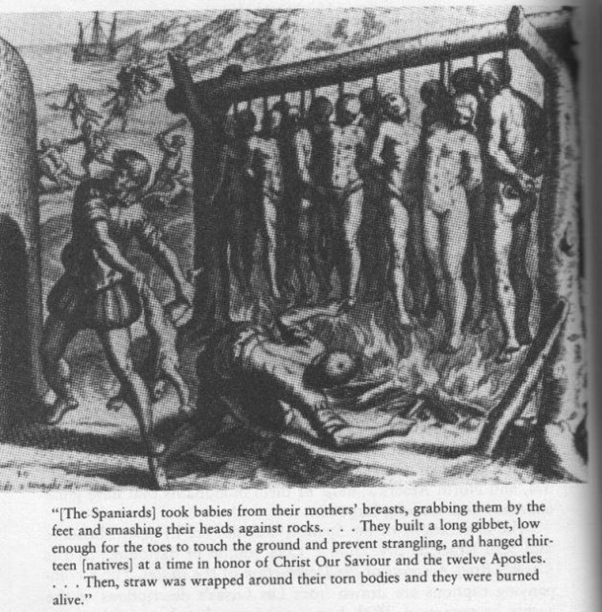 Why have none of the European colonial massacres gone on trial for genocide and holocaust giving that the massacres of the Native Indians was to settle whites and begin a new land! The holocaust of Native Indians has gone on for over 500 years and is the world’s longest holocaust. It is significant that the UN Special Envoy has recently called for America to give back lands taken from the Native Americans. What is shocking is that Britain and ‘America’ continues to deny extermination of 95,000,000 to 114,000,000 Native Americans took place in North America and Canada. 12million Native Americans before arrival of Europeans coming down to 237,000 Native Americans by 1900 had to have reasons. Their decrease is attributed to the genocidal policies adopted – mass execution, biological warfare, forced removal from homelands, incarceration, indoctrination of non-indigenous values, forces surgical sterilization of native women, prevention of religious practices. Not stopping there, the present day preachers of human rights induced contagious diseases known as ‘virgin-oil epidemics’. Diseases like small pox, measles, influenza, whooping cough, diphtheria, typhus, bubonic plague, cholera, scarlet fever, syphilis were induced to exterminate entire tribes into extinction. The British purposely gave smallpox contaminated blankets to kill people. The Mandan tribe was virtually exterminated through smallpox. 75% of Native Indians were killed by these diseases while others died in Franciscan missions in California’s ‘furnace of death’. These were all consistent Government policies so that white settlers could expand territory. Even Adolf Hitler had picked up the concept of concentration camps from the British concentration camps for the Boer prisoners in South Africa. In 1864 Reverend William Crawford summed up the attitude of the whites of Colorado “There is but one sentiment in regard to the final disposition which shall be made of the Indians: Let them be exterminated ” men, women and children together’. Reverend John Milton Chivington had urged war against Native Indian children. (Sand Creek massacre). Extermination policies in the 31st state ” California which had 150,000-250,000 Native Indians in 1850 came down to 15,000 by end of 19th century. What is unfair is that before the arrival of the Europeans to America, the areas were flourishing under Native Americans. Mexico City had a larger population than even Europe. People were healthy, well fed and led peaceful lives. Agriculture was booming and this was the same throughout all other nations and continents before Europeans landed and totally destroyed the crops to grow their plantations and start the export trade. Those complicit in destroying flourishing civilizations were the Church, the colonialists working under orders of the Church, corporations run by the Church or Governments and even doctors and judges. Their cover up of these crimes continues to this day. Chargesheets against the Church and the colonialists for their crimes against humanity are many. A Pope (Pope Urban II) that issues edicts (Papal Bull Terra Nullius ” empty land) giving kings and princes of Europe to ‘discover’ or claim land in non-Christian areas cannot have changed their ways in 21st century. In 1452 the policy of Pope Nicholas V issuing bull Romanus Pontifex declared war against all non-Christians and authorized a conquest of their nations and territories. How should we compare and contrast the current US/UK/NATO incursions/invasions and complete takeover of nations having come up with a bogus doctrine called responsibility to protect ‘R2P’? If the Church declared all non-Christians as ‘uncivilized’ and ‘subhuman’ and therefore having no right to land or nation has this policy changed if so where is it written of the change for unless as a policy the Church has acknowledged its wrongs we have every right to doubt Church involvement at political levels given that the Christians held that only they had the God-given right to take control of all lands. This right they used to justify wars, justify colonization and justify even slavery. They cannot simply ignore what they justified and they cannot ignore that they have to be accountable for every injustice as a result of these justifications. It was to fulfil the mission of the Church that Columbus set off in 1492. The ‘discoverers’ were given rights under the Doctrine of Discovery to ‘possess’ all lands and declare them ‘discovered’. All non-Christian lands were to be declared ‘discovered’ even if they were inhabited. Columbus returned to Europe in 1493 when Pope Alexander VI issued the bull inter Cetera giving Spain rights to conquer lands that Columbus had already ‘discovered’ and future lands as well. The Church also issued a decree to convert natives of the ‘discovered’ lands to Catholicism and ‘strengthen the Christian Empire’. Again we ask how far does the conversion efforts prevail as a decree issued by the now sovereign status Vatican? It cannot be denied that when the US was ‘founded’ that the Christian Whites had divide rights was ingrained in the nation’s policies. It was this thinking that was incorporated into the slave trade, violence against black people on the premise that non-whites were less than human. The treatment of Native Indians followed this same justification and in 1823 the Doctrine of Discovery became written into US law denying land rights to Native Americans in the Supreme Court case of Johnson v McIntosh. The US Chief Justice John Marshall declared that Christian European nations had taken complete control over lands of America but after America won independence in 1776, US inherited authority over America despite the occupancy of ‘natives who were heathens’. He declared that American Indians had no rights and were only tenants or residents of US land. Forced removal from homelands : The conquest theory adopted in 1784 with the Treaty of Fort Stansix resulted in Iroquois ceding lands in western New York and Pennsylvania. In 1787 the US Government completed the 5th Amendment and enacted the Northwest Ordinance creating the first organized territory out of Ohio, Indiana, Ilinois, Michigan and Wisconsin. The ordinance declared that ‘utmost good faith shall always be observed towards the Indians, their land and property shall never be taken without their consent; and, in their property, rights, and liberty they shall never be invaded or disturbed’. It took just 7 years to change that status quo. General Anthony Wayne was sent to conquer Indian tribes attempting to hold their lands. In 1802, President Jefferson’s Georgia Compact meant that all Indians were to be removed from Alabama and Mississippi. Forced Removal ” Indian Removal Act of 1830 lasted 47 years and ensured native lands were ‘cleared’ for white settlers. In 1938-39 President Jackson authorized 15,000 Cherokee Indians to be forcibly taken from their land and made to march in chains to present day Oklahoma. More than 4000 Cherokee Indians died from hunger, disease and exhaustion in what we are told is the Trail of Tears. Would it have made any difference if UNHRC or Navi Pillay was around in this period? If the land that is today called America is in actual fact belonging to the Native Indians does it not make all those ‘Americans’ that Britain and other colonialists settled in America as squatters? What heritage can these squatters be actually proud of? Forced assimilation – Denying native culture: Europeans viewed themselves as a superior culture. Europeans decided to determine the ‘moral’ character of the Native Americans. That morality was on the notion of Christianity and the only redeeming religion. Thus the Europeans cleansed the language, music, art, healing, agriculture, cooking styles and social living patterns of the natives. Europeans today speak of respect but what respect did they show towards the American Indians and their agriculture and medical wisdom? Did they not systematically destroy what these Native Indians had revered especially for people who treated Earth as the Mother? Indians were defined as subhumans, lower than animals. GeorgeWashington compared them to wolves, “beasts of prey” and called for their total destruction. In 1851 the Governor of California officially called for the extermination ofthe Indians in his state. In 1891, Frank L. Baum (gentle author of “The Wizard Of Oz”) wrote inthe Aberdeen Saturday Pioneer (Kansas) that the army should “finish thejob” by the “total annihilation” of the few remaining Indians. Education a conduit to create European surrogates ” Jesuits set up forts where youth were incarcerated and indoctrinated to follow Christian values. The Carlisle Indian Industrial School in Pennsylvania followed principle of ‘Kill the Indian to save the man’. Children was forbidden from speaking native languages, they could not dress as natives, their long hair was cut and they faced harsh discipline. Sterilizing Native Americans ” Imposing measures intended to prevent births within a group is an act of genocide under Article II of the UN General Assembly resolution 1946. How many are aware that native American Indians were made to sign sterilization forms they could not understand and the operations were all irreversible. Killing the livelihoods of Native Americans – Destroying Indian way of life by making farmers and cattle ranchers of Indians. US Government policies purposely destroyed flora and fauna which the Indians used for food and other purposes. Discovery of Gold in California promoted Indians to be chased out using the Homestead Act of 1862. 250,000 Indians in California initially ended up with barely 20,000. One of the cruelest acts was the annihilation of the buffalo. By early 1900 there were 40million buffalo’s extermination efforts by 1888 left only 2 herds. General Philip H. Sheridan was the commander of the United States forces […] he had plans of exterminating the buffalo. He thought this would kill the Plains Indians. “Kill the buffalo and you kill the Indians” he said. Genocide may have entered international law in 1948 and the term ‘holocaust’ used to cry foul against the Jews but what about the genocides committed by the European colonials throughout 500 years and genocide that these same nations are continuing to commit? Can 6million in 1945 be compared to 1million in 1500? This is an open question to every human rights charlatan and everyone who decries justice. Until the Europeans come forward to admit and atone for their crimes they have no moral right to be sitting in judgement and the rest of the world must refuse to allow these European nations and their surrogates in the US to dictate how the world should judge crimes until their criminalities are duly punished. Who will punish the Europeans for their crimes – Hundreds upon hundredsof native tribes with unique languages, learning, customs, and cultures had simply been erased from the face of the earth, hundreds upon hundreds of lives lost so land could be acquired and they could run and control a global free market and yet even after looting lands and annihilating populationsand drowning cultures the doctrine of discovery and manifest destinycontinues unabated as international law remains under the fist of those that initially broke all laws and continues to do so. As we run through histories hidden secrets that the Europeans are keeping hidden from us we need to now insist that Europeans and America has no moral right to ever sit in judgment accusing nations of crimes for which their Government policies have yet to acknowledge and compensate. We are talking about millions of people put to death, land that had been flourishing destroyed, animals killed and humans treated as sub-humans and these nations are today preaching good governance, human rights and values! The western countries could never lead! They could only conquer and rule. Everywhere the western countries went disaster struck. Problem is the leadership is about money driven by greed and thirst for power. In fact there are very few leaders in the western world who have been good. Europe was pretty much a poor smelly underdeveloped backwater in global terms for most of history, although the culture and civilization of Asia and Africa often reached across the Mediterranean and especially into the areas near the middle east. The change from poor backwater to rulers of the world started with the conquering of South Asia, America & Africa and especially the vast amounts of gold flowing in from India, South America and Africa. This gold was in large used to pay for an arms race and the building of several huge European fleets. These armies and fleets in turn was used for trade. The unfriendly trade generated more wealth, more European arms races and even more fleets and more wealth. Industrial revolution made Britain and Europe enormously wealthy, so much so that they now could do very unfriendly trade with pretty much anyone. This entry was posted on Tuesday, April 29th, 2014. You can follow any responses to this entry through the RSS 2.0 feed. You can skip to the end and leave a response.